Following closely after the debacle which was the June 20-24, 2011 meeting of the Rotterdam Convention (RC) in Geneva, the occurrence of the seminar Asbestos  Still a Killer1 in the European Parliament provided the opportunity for civil society representatives to express their outrage at the self-serving and obstructive behavior of the Canadian RC delegation. The June 30 Brussels seminar attracted participants who included European Union (EU) civil servants, trade unionists and representatives of asbestos victim support groups. Amongst the panel of speakers were asbestos experts such as Stephen Hughes, Member of the European Parliament (MEP), Dr. Jukka Takala Director of the European Agency for Safety and Health at Work, Danish trade unionist Lars Vedsmand, Bernd Eisenbach and Rolf Gehring from the Europe 2023  Asbestos Free2 campaign and Laurie Kazan-Allen, Coordinator of the International Ban Asbestos Secretariat (IBAS). Interpretation into English, French, German, Spanish, Italian, Danish and Flemish facilitated the wide ranging discussion stimulated by the presentations. Photo by courtesy of Michael Contes. Co-chair Stephen Hughes kicked off the session with a brief discussion of the process required to achieve an asbestos ban in the EU; negotiations to prohibit the marketing and use of all types of asbestos in Member States took, he said, 15 years. Nevertheless, recent work to install Wi-Fi connections in the EU Parliament in Strasbourg revealed that the building was still riddled with asbestos. Hughes called for a mandatory public register of the location of asbestos in all buildings. The ongoing threat from asbestos hidden within national infrastructures was the subject of comments by the first speaker Lars Vedsmand who highlighted the vulnerability of Danish construction workers to hazardous exposures even though the use of asbestos had been unilaterally banned 25 years earlier. Precautionary measures adopted by Scandinavian trade unions include asbestos inventories of workplaces and rigorous training schemes with certification protocols for educating workers about the asbestos hazard.3 A 13-page paper by Rolf Gehring made available at the seminar entitled: Proposals on Registration, Better Working Conditions, Training of Workers, the Recognition of Asbestos Related Disease and its Compensation detailed proposals to address some of the challenges pinpointed by Mr. Vedsmand. Co-Chair Alejandro Cercas MEP seconded Hughes call for joint action against the pro-asbestos policy of the Canadian government. Adapting EU legislation mandating equal rights for asbestos victims. EU policymakers recognize the vital role of asbestos victims' support groups. Establish a European Research Center for Asbestos-Related Diseases: ECARD. Civil society should cooperate with international agencies, regional bodies and national governments to achieve a worldwide asbestos ban; specific initiatives were indicated. A challenge by the European Union should be made regarding the $58 million loan guarantee that the Quebec government is offering to the international consortium behind the new asbestos mine in Quebec as this financial support is an unfair trade subsidy under World Trade Organization rules. A WHO Framework Convention on Asbestos Control should be implemented. MEPs should consider sanctions and trade boycotts against Canada in protest at the deplorable behavior of the Canadian delegation at the Rotterdam Convention meeting. The Comprehensive Economic and Trade Agreement between Canada and the EU should be put on hold indefinitely. Programs should be developed to comply with new EU regulations that mandate a minimum standard for occupational asbestos training. A campaign to make all European schools asbestos-free within a specified time period should be instituted. Legislative requirements regarding workers protection should be tightened and mandatory asbestos audits of workplaces, public buildings and domestic properties should be introduced. Calls should be made to investigate the manner by which two chemical companies were able to railroad EU plans to end the derogation allowing the use of asbestos-containing diaphragms; the EU should be lobbied to abolish this exemption. 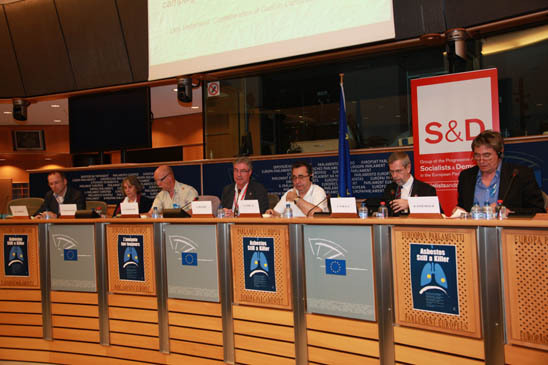 1 This seminar was organized by the Group of the Progressive Alliance of Socialists & Democrats in the European Parliament in collaboration with trade unions and non-governmental organizations. It took place on 30 June 2011 from 14.30 to 17.30, Room ASP A3G-2 European Parliament. 6 The Asbestos House is available in German, French and Italian, not in English. 10 The need for more information was underlined by a document distributed at the meeting entitled: Observations on the interpellation of the European Parliament on Asbestos. From this document it was clear that questions asked to European Commissioners by MEPs have, on the whole, either gone unanswered or have been answered inadequately.